Distribution Solutions of Ohio, Inc.
We specialize in the delivery of time-sensitive printed material, pool distribution and general LTL. We are dedicated to providing the best customer service, handling the product with the care and sense of urgency that your business demands. We operate with a fleet of 24' straight trucks to handle any LTL need, as well as a fleet of tractors with 53'trailers for your full loads, out of our terminal in Akron, OH. As well as taking care of all of your delivery needs, we will also store your materials in our warehouse. Lift gate service and inside delivery available. Click here for a list of our services. Click here for a list of some of our clients. Our service area includes all of Ohio, and some of Michigan, Indiana, Kentucky, West Virginia, Pennsylvania and New York. Click here for a map and zip code list of our service area. For more information on our services, please email us! 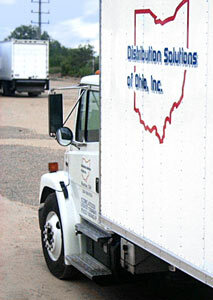 Distribution Solutions of Ohio Inc.